Cavus is used to describe feet that have excessively high arches. The bones in the foot are connected by ligaments. When the ligaments are excessively tight they hold the bones together very snuggly and often develop in to a high arched or cavus foot. Cavus feet are often hereditary. They can be associated with underlying neurological conditions that affect the spinal cord. High arched feet rarely present themselves in very young children. They often develop as the child grows and are seen more commonly in early adolescents. Patients with cerebral palsy who have developed hemiplegia with spasticity of the posterior tibial muscle. Lower leg muscle imbalance from injury. Isolated injury to the nerves in the front part of the leg or ankle that cause weakness of some leg muscles, allowing other muscles to overpower and cause a high arch foot. Acute compartment syndrome from injury to the muscles in the leg or arch. 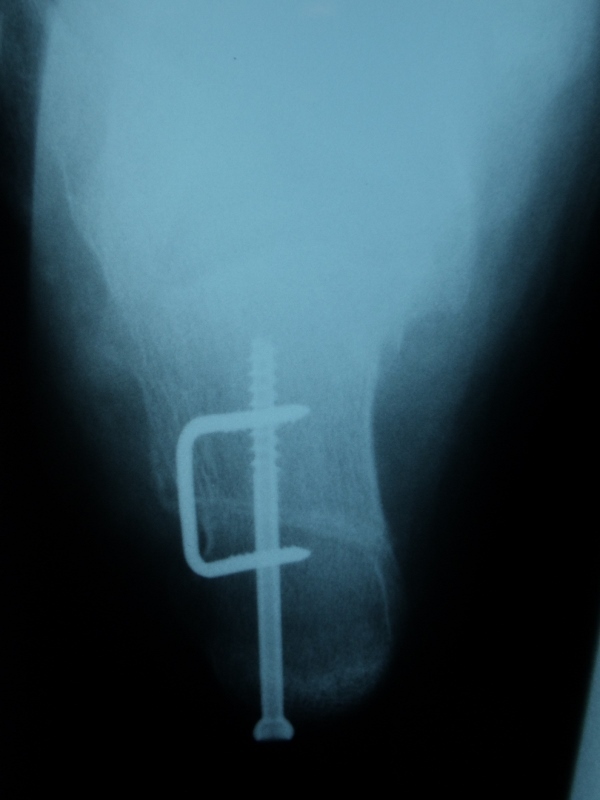 This can be seen after fractures of the tibia. Upon weightbearing it is noticed that the foot is excessively high arched. Patients often walk with more pressure toward the outside of the foot. When looking at the foot from the bottom there is often a bean shape or a curve to the foot. The front part of the foot may be slightly turned in relative to the back part of the foot. When looking at the foot from behind the heel bone may often be curved towards the inside, causing the appearance of the ankle rolling to the outside. Calluses are often present on the ball of the foot. They are most commonly affecting the first metatarsal and fifth metatarsal heads. In excessively cavus feet with tight calf muscles the toes can be excessively curved, causing hammertoes or clawtoes. The bottom of the foot often appears to be very tight and there is almost a bowstring appearance to the plantar fascia, which is the ligament that connects the heel bone to the toes. Abnormal shoe wear in which the shoe sole wears out prematurely on the outside. Patients with cavus feet are often very fast runners and rarely fatigue with sports and activities. If excessively high arched, the ankle has a tendency to roll to the outside causing ankle and subtalar joint sprains. Pain or even stress fractures can develop to the fifth metatarsal, which is the bone on the outside of the foot. Calluses often develop beneath the first metatarsal head and fifth metatarsal head. These can become very painful. In patients with underlying neurological problems in which their sensation is very poor, these calluses can turn to ulcerations and infections. A thorough family history to evaluate others that may have a similar problem. Full lower extremity and spine evaluation is necessary to evaluate the movement of the joints and strength of the lower extremity muscles. When a progressive deformity is present a neurological consult with a neurologist may be necessary and nerve conductions and EMGs to evaluate the extent of the deformity. Evaluation of the foot to see if there is flexibility or rigidity to the ankle, rearfoot, arch and forefoot region. Observation of the patient standing, walking and running. Evaluation for any instability to the ankle or subtalar joint. Thorough evaluation of muscle strength to evaluate areas of weakness, tightness or spasticity. X-rays are necessary to evaluate the deformity. Angles are drawn on the x-rays to see where the apex of the deformity is present. Bone spurs in the top part of the foot may limit movement of the ankle up and down. Bones may be abnormally curved or deformed. Stress views under fluoroscopy may be performed to check for stability of the joints and the ability to manually reduce abnormal joint positions. Many cavus feet perform great in sports and activities and no treatment should be performed. Treatment is only necessary if the deformity is progressive and pain is present or if the deformity is expected to cause problems in the future. Many cavus feet can easily be accommodated by proper shoe gear and orthotics to unload stress to the outside of the ankle and foot. Abnormally spastic muscles, which may necessitate Botox injections to prevent progression of the deformity. Areas of joint and muscle contracture may need to be stretched in a cast. Surgery should be performed relatively early to prevent the bones and joints from developing abnormal curvatures. Tendon transfers may be necessary to rebalance the foot. Tight muscle-tendon units may need to be lengthened to decrease the tightness to the inside of the ankle and foot. 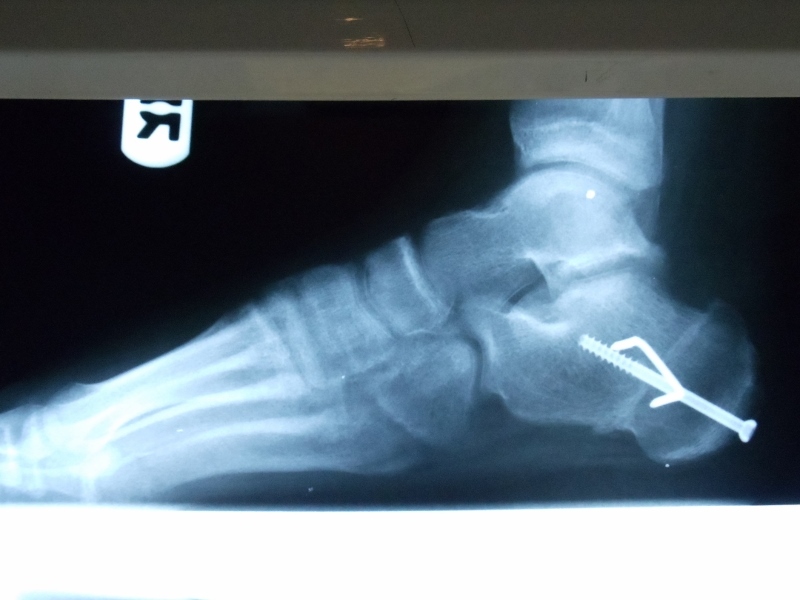 When deformity is rigid and tendon surgery not expected to benefit the patient, osteotomies to correct bony deformities may be very helpful to rebalance the foot. They may be done in conjunction with tendon transfers. If significant rigidity and deformity are present throughout the joint and the surfaces of the joint are abnormally positioned, fusions of the joint to place it in proper position may be needed. In addition, balancing the foot with tendon transfers may also be necessary to prevent future problems. If treated early, serial casting and physical therapy may provide a well-balanced foot to allow normal ambulation and even sports activities. If contractures of the muscles are noted, early serial casting will help stretch out tight muscles and physical therapy will help to strengthen weak ones. If the bones are abnormally positioned putting stress on joints, osteotomies can provide great long-term benefits. If severe deformities are present fusions can also help to rebalance the foot and provide a foot and ankle that can ambulate pain free. In many cases the underlying neurological problem is present, which makes this problem worse despite all treatments. Working in conjunction with a neurologist to evaluate the long-term expectations is critical. The cavus or high arch foot not only demonstrates an increase in a person' s instep, but the heel bone (calcaneus) typically is inverted when viewed from behind. Calcaneal axial films shows an inward arc of the heel bone (top left). An x-ray view from the side shows an elevation of the pitch of the calcaneus from the level of the ground. 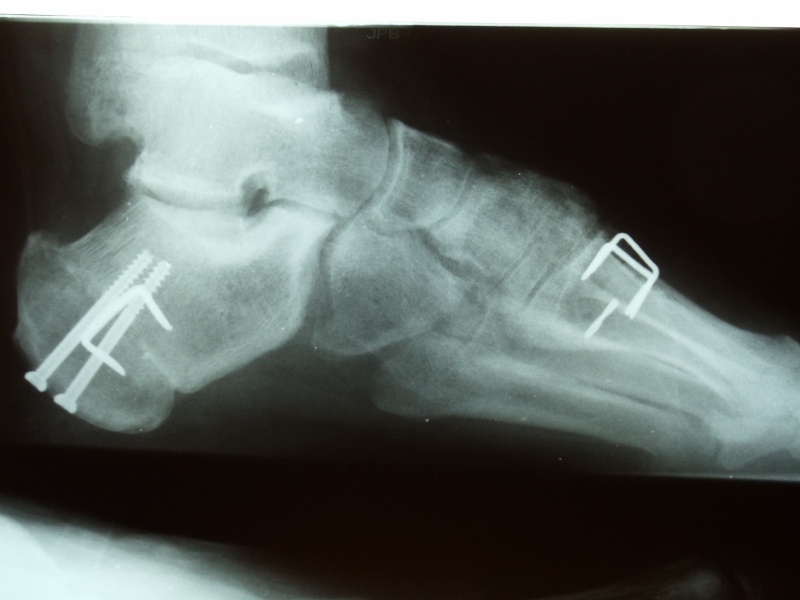 Surgical reconstruction of the cavus foot many times requires an osteotomy of the heel bone (calcaneus) that is fixated with screws, staples, or surgical plates. In most cases it is combination of these devices (left image). In more severe cases a midfoot procedure is also required to decrease the apex of the elevated arch deformity in order to correct mechanics to relieve symptoms (right image). The images below depict a case where in order to decrease the deformity both calcanael and midfoot procedure where necessary. There is a decrease in the pitch of the heel bone relative to the ground and decrease in the apex of the arch (right). One can see the c-shape of the heel bone from this view before surgical correction (pictured on left), and after surgical correction the heel bone is in a more rectus (straight) alignment relative to the ground and the leg (pictured on right).